Earlier this month, authorities in Turkmenistan allowed a prominent cultural icon, Geldy Kyarizov, to leave the country. It is a noteworthy development for a country that rights activists describe as one of the most repressive states on earth, but it is unlikely that it signals a significant easing of the Turkmen government’s authoritarian ways. Kyarizov was permitted to board a flight on September 14 to Moscow, where he was reunited with his wife, Yulia Serebryannik. On September 20, Kyazirov’s 14-year-old daughter Sofia and his sister-in-law Elena also were allowed to leave, enabling the family to reunite in the Russian capital, according to a statement released by Prove They Are Alive, a civil society campaign dedicated to raising awareness about political prisoners in Turkmenistan. Kyarizov gained international recognition in the late 1980s through his work to restore and promote the Akhal-Teke horse breed, and help brand it as a national symbol of independent Turkmenistan. Believed to be among the oldest breeds of horses, Akhal-Tekes are known for their endurance and ability to thrive under harsh conditions. 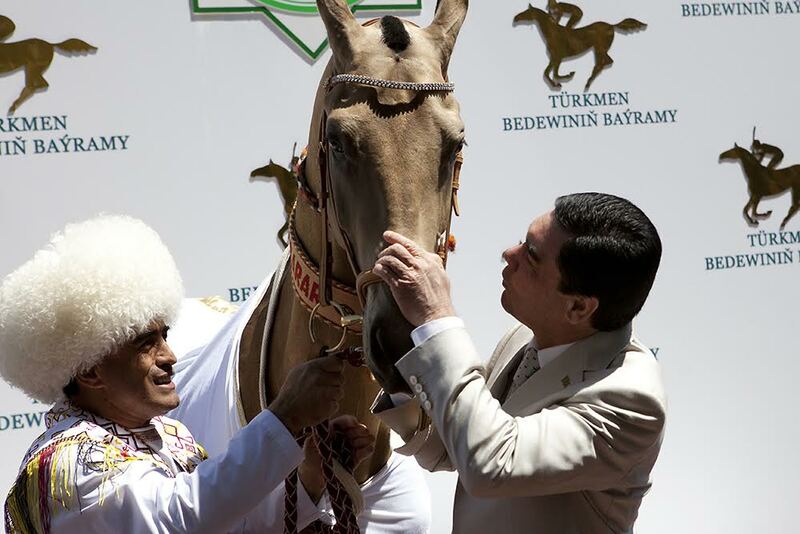 Saparmurat Niyazov, Turkmenistan’s dictator from 1991-2006, initially lavished favors on Kyarizov, going so far as to appoint him Minister of Horses in the Turkmen government. But as was the case with many other top officials, Kyarizov fell out of favor, and Niyazov imprisoned him in 2002. He endured over five years in Turkmenistan’s penitentiary system, including six months in the notorious Ovadan Depe prison, where he was tortured, denied medical care, and suffered severe weight loss. Following Niyazov’s sudden death in late 2006, Turkmenistan’s new leader, Gurbanguly Berdymukhamedov, amnestied Kyarizov, yet denied him the right to leave the country. Berdymukhamedov, it is worth noting, is a lover of the Akhal-Teke breed. He calls himself the ‘People’s Horse Breeder,’ and is known to present studs as gifts to dignitaries. Embarrassingly, he fell off his horse in the 2013 celebration of the Day of the Horse. It is a crime to view footage of that mishap inside Turkmenistan. The timing of Kyarizov’s departure for Moscow is likely not accidental. It occurred just days before the annual Human Dimension Implementation Meeting (HDIM) of the Organization for Security and Cooperation in Europe. The gathering in Warsaw offers a platform for civil society activists from across Eurasia, Europe, the United States and Canada to discuss national and regional human rights concerns. Rights groups had planned to profile Kyarizov’s case, along with other Turkmen government abuses, at the Warsaw HDIM. In addition, Berdymukhamedov is scheduled to be in New York from September 24-27 to attend the 70th session of the United Nations General Assembly, according to the Turkmenistan.ru news agency. Letting Kyarizov leave, then, seems like a calculated step by Ashgabat, designed to relieve pressure on Turkmen officials representing the country in Warsaw and New York. Since gaining power almost a decade ago, Berdymukhamedov has built upon the authoritarian foundation created by his predecessor. In its most recent survey of countries’ rights records, the watchdog group Freedom House rated Turkmenistan among “the worst of the worst,” along with North Korea, Somalia, Sudan and Syria. Several factors have muted Western criticism of the Turkmen government’s behavior, specifically the country’s abundant reserves of natural gas and the common border with Afghanistan. Turkmen energy and the government’s cooperation in efforts to combat Islamic militants in Afghanistan have been important factors for both Europe and the US in their relations with Turkmenistan. But these factors are now less important than they used to be. The precipitous decline of global energy prices, the deterioration of trade relations with Russia, and an unprofitable dependence on China for its gas sales have put Turkmenistan at a disadvantage. Thus, Berdymukhamedov had an incentive to make a rights gesture in order to get what he evidently really wants – a pipeline deal. When he is in New York, Berdymukhamedov will undoubtedly look to tout the Turkmenistan-Afghanistan-Pakistan-India (TAPI) pipeline. The project has long been stalled, but there are indications that Berdymukhamedov could use the pipeline to revive Turkmenistan’s flagging economic fortunes. In the most serious sign to date that the slump in energy prices is battering the Turkmen treasury, the government announced earlier this month major cutbacks in the country’s social welfare system. The real question is whether Berdymukhamedov’s decision to let Kyarizov go reflects a change in the government’s strategic thinking. Given Turkmenistan’s poor rights record, Berdymukhamedov does not deserve the benefit of the doubt. It is important to remember that the goodwill gesture of Kyazirov’s departure stems not from the rule of law, but is rooted in the arbitrariness inherent in Berdymukhamedov’s governing style. At the UN General Assembly, and in any bilateral talks that may take place on the sidelines, engagement with Turkmenistan should focus on broad, institutional reforms aimed at fighting corruption and strengthening individual liberties and democratic institutions. Without structural, deep-rooted reforms, ordering freedom for an individual is nothing more than paying lip service to the law. Sonia Zilberman works on Turkmenistan at Crude Accountability (crudeaccountability.org), a watchdog group focusing on energy developments in Eurasia. Her work focuses on human and environmental rights.